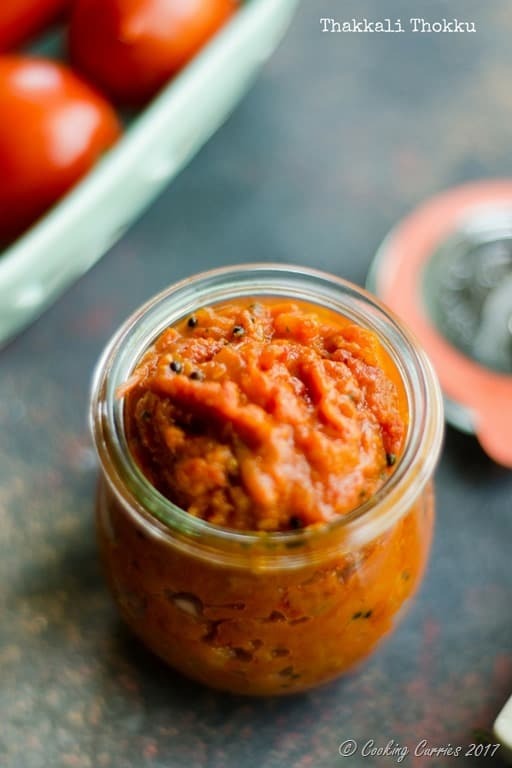 Ripe tomatoes that are cooked down with oil and spices, make this Thakkali Thokku, which can be used as a chutney for Idlis and Dosas or as a pickle with curd / yogurt rice! Those summer fresh tomatoes are about to come in and if you have planted a few tomato plants like we have, expect to get a ton of tomatoes all at once, that you wont be able to figure out what to do with so many of them all at once. Having a game plan will definitely help. 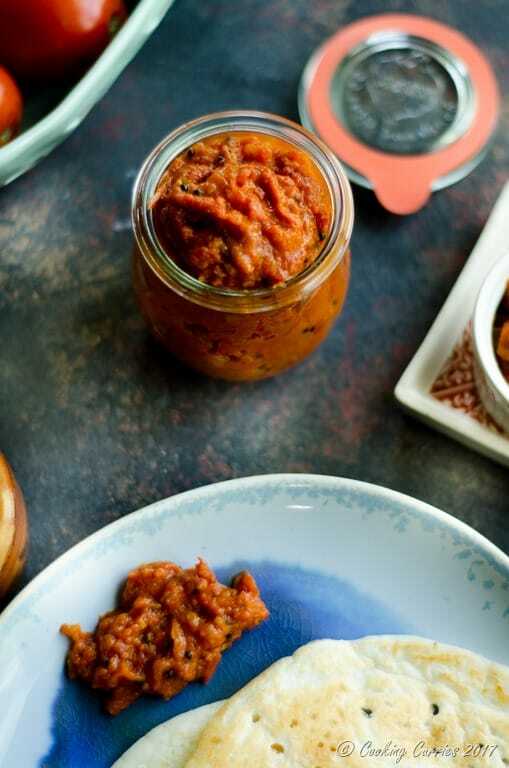 This tomato chutney / pickle that gets down to just 10-12 oz or about a cup and a half needs about 10 – 12 medium sized tomatoes. You can easily double this batch and save some for later as well. 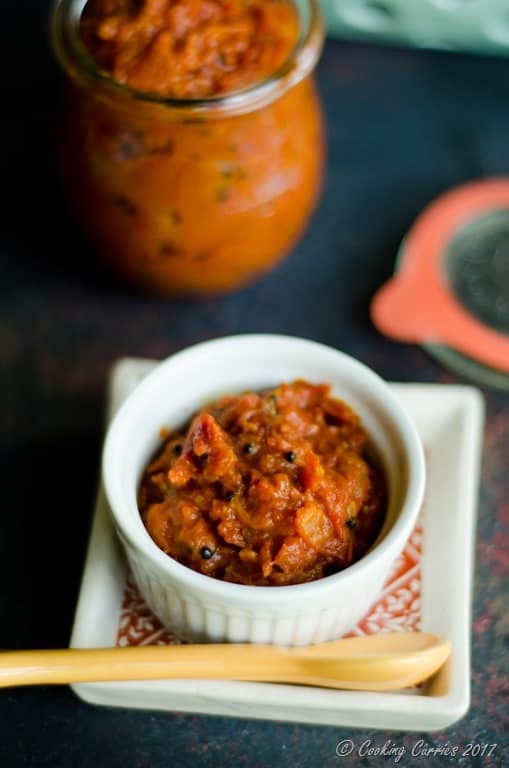 This Thakkali Thokku is a travel favorite amongst South Indian families in India. 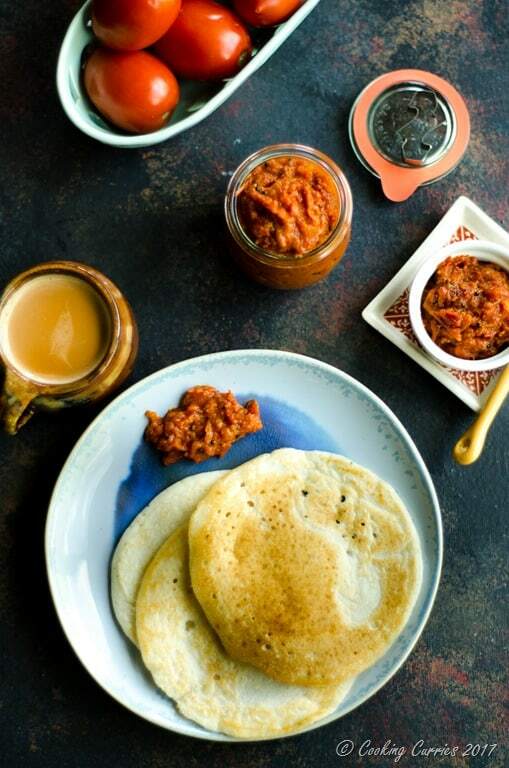 Every time my parents travel to visit us here to the US or wherever else they travel, they always make some thokku and take it along with some rotis or even bread. All of the water is evaporated in this pickle and there is oil, salt and asafetida, that helps keep it from getting spoilt for a day or two at least without a need for refrigeration. If refrigerated, this thokku can stay for up to 10 days or so. You just gotta be really careful when taking some out of the jar to use it. Just use a clean, dry spoon and make sure the jar stays relatively dry and you can enjoy it for a long time. 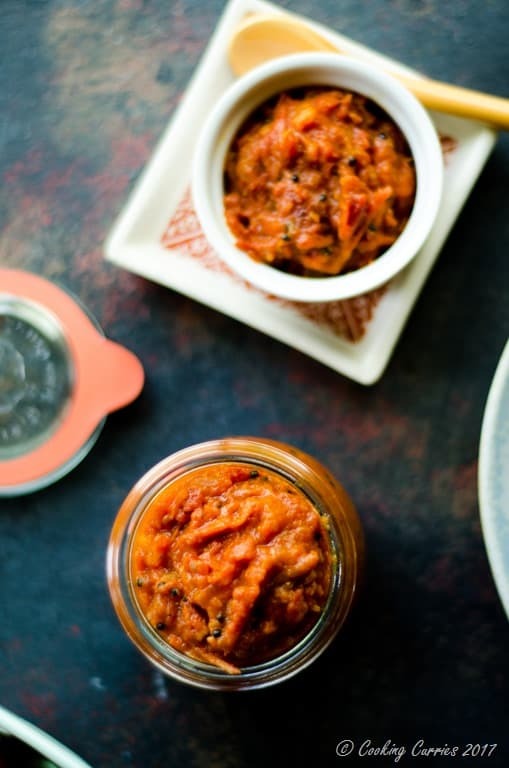 When I first made this thakkali thokku, I was torn between the idea of relishing it as a chutney with some hot dosas or as a pickle with some tangy cooling curd rice. I made it after lunch time, so I quickly made a couple of dosas to go along with my afternoon tea and then I made yogurt rice for dinner, so we could enjoy this again. I did not have to worry about saving this and refrigerating it. It was all done and cleaned out the second day itself. I can also vouch for the fact that this makes for a great dip for tortilla chips or even a spread for your sandwiches and wraps. The possibilities are just endless. Chop the tomatoes roughly and keep aside. Add the tomatoes and cook over medium high heat. Once the tomatoes start to soften, add the turmeric powder, salt and red chilli powder. Keep cooking the tomatoes down till almost no water / liquid is left. Add the jaggery and mix it in well. Cook the tomatoes down, stirring well, till they are nice and thick in consistency, almost like a spread. Toast the fenugreek seeds to be a little fragrant over medium hih heat and crush them in a mortar and pestle. Sprinkle this over the thokku, mix well and remove from heat. Let it cool down completely and then move to a dry glass jar and store at room temperature for up to 2 days and in the refrigerator up to 10 days. I can imagine how tamarind will be awesome in this. This is a Tamil version of the Thokku. Do try and let me know how you like it ?